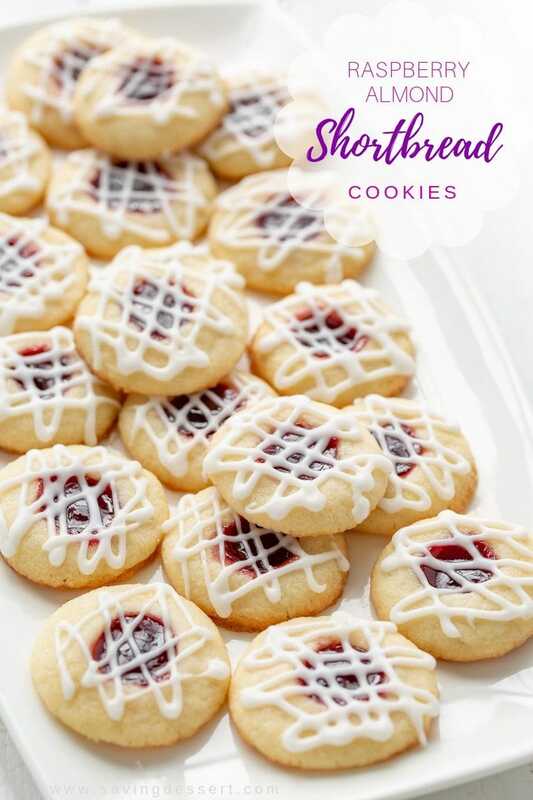 With a subtle almond flavor and a buttery, crisp shortbread base, these cookies are topped with sweet raspberry jam and a sweet almond flavored drizzle. These cookies have great texture, an outstanding flavor combination, they’re super cute and melt-in-your mouth delicious! When in doubt, cookies are always the best choice for dessert. You won’t need a plate, fork or even a knife to enjoy a cookie, or two. Whether you’re filling your cookie jar at home, or sharing with co-workers during the holidays, these Raspberry Almond Shortbread Thumbprints will be a memorable treat all will enjoy. There is so much flavor it’s almost surprising when you bite into these tender crisp cookies. 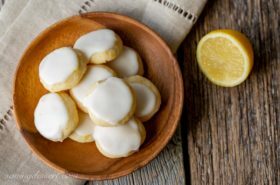 Over the years I’ve received some great comments, suggestions, a few questions and one or two complaints about the cookie recipe originally adapted from Land-O-Lakes. The less than glowing reviews indicated the cookie dough was dry and few others mentioned that the cookie dough spread too much. I’ve tested and retested this recipe and made lots of notes to help you be the star baker at your next cookie challenge! These are fantastic, delicious cookies and I think they’re easy to make, but you have to follow the directions and take care when measuring the ingredients. I’ve organized some tips for success and hope you find them easy to make too. Make sure your butter is at room temperature when mixing up the dough. If it’s too cold, the dough may not mix well and will be crumbly. Properly measure your flour. Lightly spoon the flour into the measuring cup and use the back of a table knife to level off the top. If you pack the flour in the measuring cup or have a rounded, heaping cup, you will have dry, crumbly cookie dough. If your cookie dough is dry, you probably added too much flour. As this cookie dough is made with only a few ingredients, using good quality butter can make or break your cookies. I always bake with unsalted Land-O-Lakes butter. I’ve had other recipes fail when I used a store brand butter so don’t risk it. Stick with better butter! Refrigerate your cookie dough for a full hour before rolling into balls. Keep any unused dough in the refrigerator until you’re ready to roll out more cookies. You can also roll all the cookies at once and keep them in the refrigerator until ready to bake. Keep the dough as cold as possible and this will help minimize spreading. These are a very buttery cookie, and butter melts easily. The dough balls must be cold when going in the oven. Over the years I’ve found that I prefer my AirBake insulated rimless cookie sheet (see Amazon link below). Cut two sheets of parchment paper to fit on the baking sheet. Once one pan comes out of the oven slide the parchment, with cookies attached, onto a cooling rack. Easy peasy. Then slide the next parchment filled with cookie dough balls right onto the still warm sheet and bake. Don’t let the dough balls sit on a hot pan. If you don’t have one and don’t want to purchase a rimless baking sheet, make sure your cookie sheet is cooled completely before placing the dough balls on the pan. If it’s not cold, the cookies will begin to melt and will spread too much in the oven. Starting with cold dough and a cold pan is crucial. Use good quality raspberry jam. Do not use jelly. 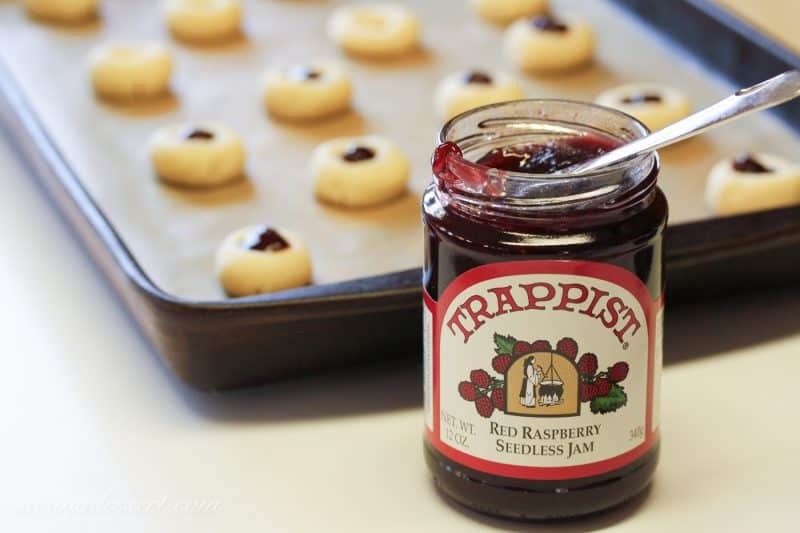 I’ve used several different brands of jam – Smuckers seedless Raspberry Jam is one of my favorites for baking. I’ve added 2 teaspoons cornstarch to this recipe. Cornstarch helps stabilize the dough so it’s easier for them to hold their shape. Shortbread typically does not contain cornstarch in the mix so I wanted to keep it to the smallest amount possible. Two teaspoons seems about right. One of the most important tips I can offer is this: when making the indentation for the jam use a small finger, press it straight down into the center of the dough, and only go about halfway through. Do not make the indentation too deep! The bigger the hole, the wider the cookies will spread. The jam may be over the top (see photos above) but that’s okay. Use a well rounded 1/4 teaspoon of jam. The cookies are best when lightly browned on the bottom. Don’t over-bake! Cool for a few minutes on the pan before removing to the wire rack. There is a wide range for measuring the almond extract in the glaze ingredients. I would start with less, taste the glaze and add more if you think it needs it. Almond extract is not always a favorite flavor – but it is one of mine! Take the time to test the recipe if you’re making them for a special event or party. You never want to try a new recipe on the day of an event when you have to have the cookies! This recipe takes some time to chill the dough, cool the cookies, ice the cookies and allow the glaze to set. Each step is easy but there is waiting time in between. Finally, bake two or three cookies to start and see how they do. You may find you want a larger hole, more jam, a shorter or longer baking time, etc. I hope the tips help you have great success with these cookies. They are really terrific with a unique texture, amazing combination of flavors and a lovely sweet finish. 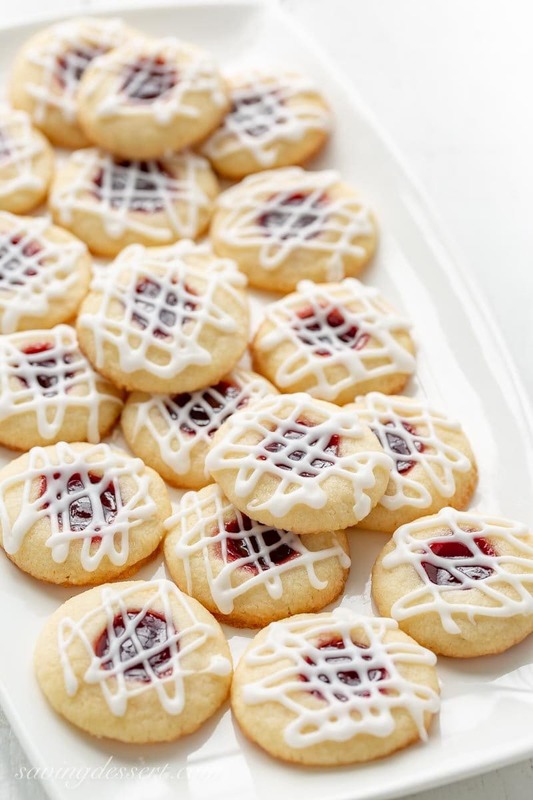 When storing, these Raspberry Almond Shortbread Thumbprints are best kept in a single layer. If you need to stack the cookies use a sheet of wax paper between layers and store the cookies in the refrigerator until ready to serve. Sometimes I use a lot of glaze, and sometimes just a little – and I love them both ways. Try one of the finished cookies and see how you like it best. These are easy to make, just follow the directions and enjoy! AirBake Natural Insulated Cookie Sheet, 14×12 inches, made of 100-percent aluminum providing superior baking results. My cookie sheet is at least 40 years old and still going strong. This cookie sheet helps prevent over-browning and may reduce baking time too. Check out the great price by clicking on the photo for more information. 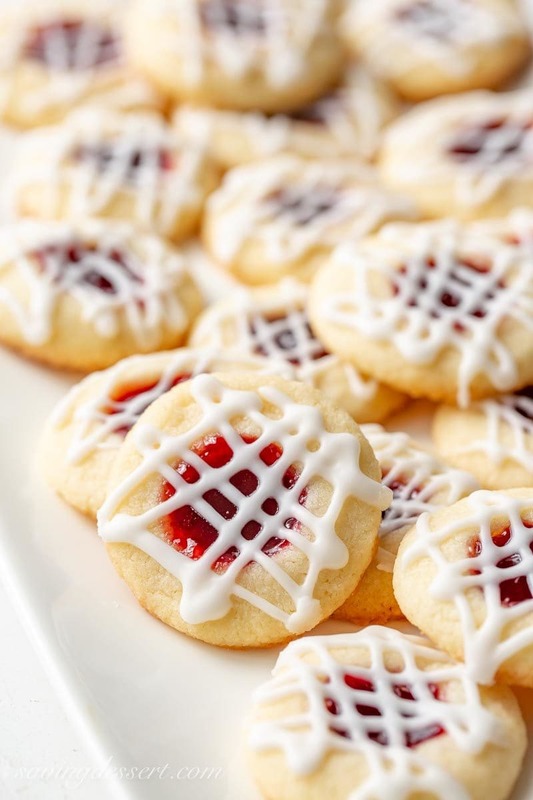 A tender shortbread cookie packed with raspberry jam & topped with a simple almond flavored icing. Not just for the holidays! In a small mixing bowl whisk together the flour, cornstarch and salt. Set aside. In a large mixing bowl, combine the butter, granulated sugar and 1/2 teaspoon almond extract. Beat at medium speed until the butter mixture is creamy and light. Scrape down the sides of mixing bowl as needed. Reduce the speed to low and gradually add the flour mixture. Mix until well blended. Cover and refrigerate the dough for 1 hours. Preheat oven to 350 degrees. Line a baking sheet with parchment paper. 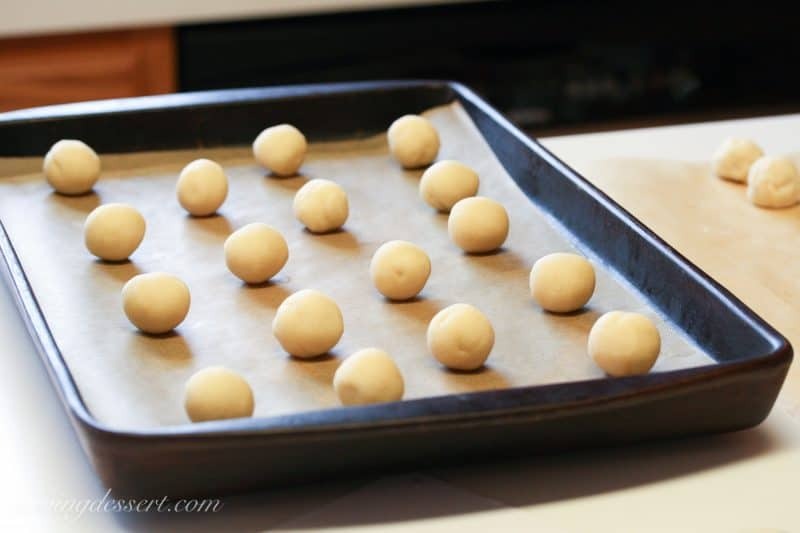 Shape dough into 1-inch balls and place 2 inches apart on the prepared pan. Keep remaining cookie dough refrigerated until needed. Make an indentation straight down into the center of each cookie (about half way to the bottom) with your smallest finger. Fill each with a well rounded 1/4 teaspoon jam. Bake for 11 to 15 minutes or until edges are just lightly browned. Let the cookies stand 1 minute before removing to a cooling rack. Cool completely. Please read all notes and instructions before beginning. This is an easy recipe, but must be followed for best results. When measuring the flour, lightly spoon into measuring cup and level off the top with the flat side of a table knife. Do not pack the flour into the cup. Be sure you are using raspberry jam. Do not use jelly. If your dough is dry and crumbly, you probably added too much flour. Try adding 1 tablespoon of butter to the cookie dough. I always use Land-O-Lakes unsalted butter in all my recipes. If you use salted butter please omit the 1/4 teaspoon additional salt added with the flour. Do not over-bake. The cookies are best just lightly browned on the bottom. Keep dough refrigerated between batches. With a high butter content, the dough will quickly warm when left at room temperature. Place dough balls on a cool baking sheet, or parchment paper. The cookies will begin to spread if placed on a hot pan. To make it easy you can place the dough balls on parchment and then slide them onto a rimless baking pan and bake immediately. I use a light colored rimless baking sheet to make this process easy and quick. Do not smash the entire dough ball flat when making the indentation. Use a small finger and push straight down into the center of the cookie. DO NOT MAKE THE INDENTION TOO DEEP. The bigger the whole, the wider the cookies will spread. Please see the photos for reference. Even though they are called thumbprints, if you use your thumb they may not spread correctly and hold the jelly in the pocket. Bake 3-4 cookies first to see how they do for you. If they are spreading too much, refrigerate the dough balls with jam for 15 minutes before baking. Do these cookies taste anything like Spritz cookies ? Hi Elizabeth. They have a similar texture, and since they are a light butter cookie, I would say they taste similar to Spritz cookies. However, the raspberry jam really adds a lot of flavor. They are buttery and tender so they are similar to Spritz in that way. Good luck! These are my new favorite cookie. Super easy to make and are simply delicious! I will be making them again and again and again!!! Thank you so much for the feedback Kim! We appreciate you trying this recipe and for letting us know how it turned out for you. Have a wonderful holiday! These cookies are a hit whenever I bake them. They are a family favorite for sure. I’ve been making them for 3 years for the holidays. Thanks for sharing the recipe. Wondering if I can freeze the dough for a couple of days. I’d like to get ahead of the process by doing the dough ahead and baking closet to the day. Thanks! Hi Dali! I haven’t tried freezing the entire recipe at one time. If you do, I would form the cookie dough into a flat disc so it can thaw easily. Good luck. Hope this turns out and let us know if this works for you! This recipe is amazing. I have made these several times and they always come out perfect. This is one of my top requested cookies by family and friends. One of my favorites too! Thank you Tiffany! We love this cookie too. There’s something special about the buttery cookie and the sweet jam. Yummy! Hope you have a wonderful holiday season 🙂 Thanks again! 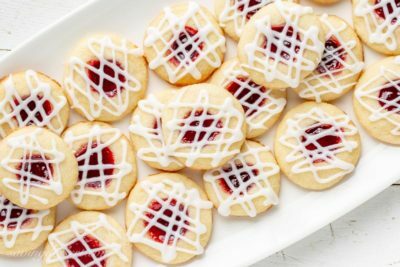 I love this recipe and I get so many compliments on the cookies but how do you keep the jam from “bleeding” into the icing. It turns the icing pink. Refrigerating helps Paula – but over time the icing does turn a little pink. If the icing is very thin, it seems to be more pronounced. If you’re making them ahead, wait to ice them closer to the time you plan to serve. Thanks for the great question. I’m so confused as to where the actual recipes are. 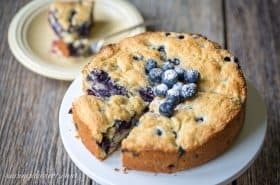 I’m looking for the almond raspberry thumbprint recipe and can only find the tips but not the recipe. Thank you for any help. Hi Hollie. All the recipes are at the bottom of each post. The printable recipe card is shaded in beige and is just above the box you used to leave a comment. Please let me know if you don’t see it. Is there any reason why I couldn’t make the dough and roll it into balls and then freeze them to make at a later time? I don’t know Marci, I have not tried freezing the unbaked cookies. I might suggest making the dough balls the day before and keep them sealed in an airtight container in the refrigerator. I would worry about them being too dry if frozen. If you try it, please let us know how it turns out. Thanks so much and happy baking! 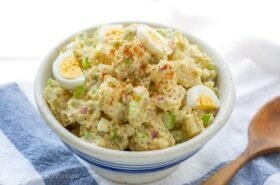 Hi, love this recipe! No eggs, right? I’ve made these for my boyfriend’s family before and they absolutely raved over them. They were requested again for Thanksgiving and now I have to make about 5 batches! Do these keep well in the refrigerator over night? Do you have extra tips for preserving them? I’m just hoping they don’t dry out because they were so soft and buttery last time, and I really don’t want to disappoint! Hi Jordan. I think you are asking about refrigerating the baked cookies. Yes you can keep them chilled for longer storage times, but I would not put the drizzled icing on until the day you plan to serve. It could bleed into the jam a little and turn pink if it sits too long. The cookies will not be dry, unless they are over-baked. Good luck – such a big batch! Thanks for the great question and happy holidays to you and yours. Oh my goodness..these are so good and easy to do. My mixer gave out and I had to combine by hand..no issues with dough at all. Chilling between batches is the key. By the last batch I got the hang of the perfect indent by using the back of a 1/4 measure spoon. I used raspberry All Fruit on first batch and strawberry jam on the second. Jam works much better. Thanks for a great recipe. And the pointers. I’m doing a bit of pre-holiday baking. Testing recipes. So far, these are my husband’s favorite. He ate at least a dozen the first night I made them. He’s not a big eater of sweets, so many times I’m left with most of what I bake. These turned out perfect and were absolutely scrumptious! I did reduce the cornstarch to 1 tsp., but other than that, I followed the directions to a “T”. Great! Thank you so much for the feedback Donna. This is a favorite cookie of mine, and it has such a delicious flavor, they are addictive. It helps all our readers to know that it turned out delicious for others. Hope all the extra “recipe details” helped. Good for you! Thanks again and have a wonderful holiday season. I have made a similar recipe using almond flour and all-purpose flour. The result was fabulous! Great to know – and I love the addition of almond flour. Thanks so much! I like this idea Gretchen. I re-tested the recipe recently and updated adding 2 teaspoons cornstarch. They worked beautifully for me, again 🙂 Hope they did for you too! Yeah! Thanks so much Milena – they seem to be troublesome but so glad they worked for you too. Thanks for letting us know and happy holidays! Tried these tonight. Used Land O Lakes and followed the recipe exactly. Mine flattened out and aren’t nearly as pretty as yours, but they taste great! Can definitely taste the almond. I might try again and do vanilla in the icing drizzle. Not sure what to do about the flattening. Thanks for the feedback Joyce. I wonder if the kind of jam makes a big difference with how much they spread. I’m going to be testing these again and hope to find a solution for the problems. I’m sorry they flattened out for you, and I bet they are pretty 🙂 I’m also going to try adding a tablespoon or two of cornstarch and see if that helps. Thanks for giving them a try and for the feedback! UPDATE: I added 2 teaspoons cornstarch to the flour and had no trouble. I’ve updated the notes, recipe and made suggestions for success. Hope this helps! I’ve found that chilling them overnite or at least 3 hours works best. I balled up one batch at a time so the dough didn’t sit out too long during that process. I also made sure not to use my finger to make the indentation but instead used the backside of a 1/4 tsp measuring spoon and gently pressed down just enough to make a pocket to hold the jam. It was my very first time making them too and they turned out perfect! Good luck on your next attempt! Thank you so much Renee! Glad they worked out for you. Happy holidays! I’m about to try this recipe for a cookie exchange tomorrow but plan to weigh the flour instead so that I don’t end up with a “crumby” dough like many complained about. 9 oz is the conversion for 2 cups flour by the way. Also I will be using LOL unsalted butter as well. Fingers crossed! They turned out absolutely perfect!!! I think the key is LOL butter at proper temp and weighing out the flour for accuracy. I took advice from another person who commented and used a 1/4tsp spoon to make the perfect size indentation in the center. Wish I could post a photo! Thanks again! Yeah! Thank you so much Renee. Post a photo on Instagram and tag us if you want. So happy you figured it all out! Love the idea of using the back of a measuring spoon – brilliant 🙂 Have a wonderful holiday season! These look amazing! I’m thinking of using this recipe for a cookie exchange. How did you package them to keep them pretty? Wax or parchment paper between layers? Do the jam and icing set up? Or do they remain kind of sticky? Chi Jenna – I packaged the cookies with wax paper between the layers. The jam sets up but is still a little tacky. The icing should harden but not as much as royal icing. If you’re not shipping them and are just sharing locally, I think they will do great. Tight packaging to ship out of town may lead to a less pretty cookie. Everybody said they arrived fine for this cookie exchange so that’s what I’m going with! Thanks! Thank you for giving them a try – a few people said the dough has been crumbly so be sure to use Land O Lakes butter. That’s the only brand I’ve tested with. If you use unsalted butter, be sure to add salt to the dough. Good luck! I was so excited to make these. However, they spread out so much and the filling came out over the sides. I followed the recipe very closely. Why did this happen? Hi Lynne – I am so sorry you had problems with this recipe. As you can see from my photos, I had a very good experience with this Land-O-Lakes recipe. I mentioned to another reader that had a similar problem, that I tested mine with Land-O-Lakes butter. I have bought off-brands of butter before, and had failed recipes that always worked before. I don’t know why this happened to your cookies, but perhaps you could refrigerate the dough a little longer and make sure it is firm before baking. I double checked my recipe against the Land-O-Lakes recipe and it seems everything is correct. I am sorry – hope you will try again. Hi! I am wondering if anyone else had to modify the proportions of the ingredients. I followed the recipe to a T but I had to add another stick of butter to the dough for without it, it was so crummy! I tried forming it in my hands but it all fell to pieces. With another stick of butter it made an actual dough and I stuck it in the fridge for an hour at that point. For the glaze, I had to add more water, probably another tablespoon or soon. The recipe called for 2 teaspoons but this just made a glob of powdered sugar stuck to my whisk! Did anyone else run into these same issues? Thanks! Hi Meg – I haven’t heard any complaints like this from our readers. The recipe was adapted from one on the Land-O-Lakes site so you’re welcome to refer back to the original as well (Link to original recipe – HERE) but I am very sorry you had problems with the recipe. I once had to throw away an entire batch of fudge because I used an off brand of butter. It separated and would not come together but ended up a pool of oil. I don’t know what kind you used, but I’m sure all ingredients are not created equal. Adding an extra teaspoon of water to the glaze might have made the difference there. Each area of the country is different with varying humidity levels, etc. I will update the recipe to note that an additional teaspoon of water may be needed for drizzling consistency. Again so sorry for the troubles, but thanks for trying the recipe. Land o lakes. A real disaster so my husband tried with same result. Very sorry you had bad results Judy. I hope you will try again sometime with the Land-O-Lakes butter. Just tried making them. The dough was all crumbs, not sticky at all. I added water and hopefully they turn out ok.
Hi Alex. As you can see from my photos, mine were not at all dry. I hope they turned out okay. I’m not sure if you used a different brand of butter, but I have found it makes all the difference. Good luck. I had the exact thing happen to me. I also added a bit of water. They definitely didn’t turn out as pretty, but they still taste good! I’ll have to try again sometime. The proportions are off for me too – not close to a dough. Any suggestions? Hi Valerie – I’m not sure why they didn’t turn out for you. I’ve not had any trouble with these cookies. “Not close to a dough” do you mean it didn’t come together? Too dry? Too wet? Same here Meg. Next time I will try to get the Land o Lakes brand and see if that helps. Thanks for the feedback Janice – I’ll be working on this recipe and hopefully develop a better process for fool-proof results. Best wishes for a happy and healthy New Year! How can I make this w/o any nut extcats? My daughter suffers frimm anaphalaxis to all nuts. I thought a vanilla extac would work. So any advice would be very help full. Hi Gina – these cookies would be great with vanilla extract – no worries! Thank you for asking such a great question. There are many people that don’t care for almond extract anyway. Hope you had a wonderful Thanksgiving! Thanks again. Hi, how long do they stay fresh after you make them? A week..? Hi Danielle – If you store them in a cold location like a garage or unheated porch, they should be great for at least a week. The jam may cause them to be a little more soft but that’s not necessarily a bad thing. They are delicious and super easy too. Thanks for the great question! Hi Lisa! Thank you so much – I will email you about the tribe – thank you! I love the looks of these cookies!! Yumm I will make. 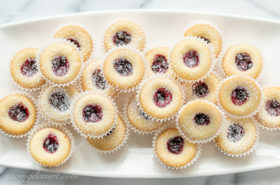 Someone asked if they freeze well… I freeze my thumbprints with jam and they turn out great! I put in freezer bags with wax paper in between each layer. Thanks Cindy – do you bake them before freezing or bake and then freeze? Thanks for commenting! Could you please tell me if you use icing sugar in this recipe or white sugar. Most of my shortbread cookie recipes call for icing sugar. Hi Ruth Anne – the sugar for the cookie dough is granulated sugar – not icing/powdered sugar. However I do agree that many shortbread recipes use icing sugar so if you decide to substitute the granulated sugar please let me know how it turns out! I’ll update my recipe to clarify – thanks for the great question. Hi, do these cookies freeze well? Hi Cindy – sorry to be so late in replying. I was in the mountains with no internet for 5 days. 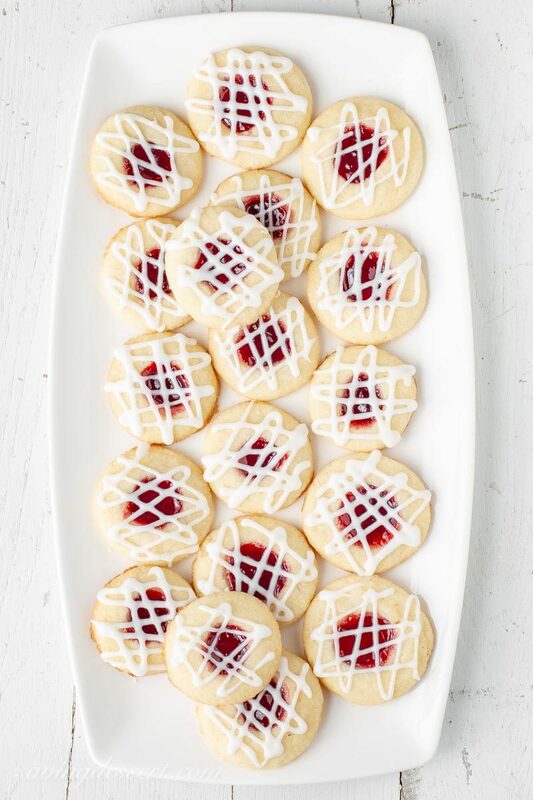 I don’t think these cookies would freeze week because of the jam. Perhaps they would be fine to freeze before filling and icing, but I have not tested it. Hope you enjoy the cookies, they are pretty terrific! I make these and freeze them all the time. They freeze beautifully even with the jam! Hi, I really want to make these! They sound delicious and ridiculously simple! Did you use salted or unsalted butter? I’m not much of a baker so I never know unless it is specifically stated. Thanks! I found that the 1/4 tsp. worked perfectly to make the size indention I needed. I lightly pressed it into the balls, and it was a perfect space for the jam. I used Eden Grape Butter instead — next time I’ll figure out how to add a PB component to this for a fun twist. Maybe in the icing. I used a combination of tapioca, coconut, garbanzo bean, and buckwheat flour to make this gluten free! Thanks for the share. Next step is to veganize! Wow Leah – you did a great job on these! Thanks so much for the tips and suggestions. Have a great day! This recipe makes about 38-42 cookies depending on how big or small you make them. Hope you enjoy! Thanks Ann – they are easy to make too. Hope you’ll give them a try! Hi Kelly. I would remove the dough from the refrigerator and see if when the butter softens, the dough holds together. Was the butter at room temperature? Does it come together when you press it into a ball? I hope this helps – and so sorry the dough is dry. I love thumbprints, Tricia. Yours drizzled with white icing looks extremely lovely. I'm making these today with a Blackberry jam! Can't wait! 🙂 Thanks for the recipe! PS…. did you use salted or unsalted butter? I used blackberry jam and they were so good! I’m making 8 batches. Would you recommend freezing them? I Domenica – I don’t think you would want to freeze them with the icing. But think they will be fine to be frozen once baked. Flash freeze in a single layer before stacking between sheets of wax or parchment paper. Good luck! Oh my, everything about these cookies sounds amazing. What a lovely choice for the cookie swap! I'd want to make little peanut butter cookie sandwiches out of those! What a fun and worthwhile event Tricia! These are some of my all time favorite cookies! I've been making them for years and they always receive rave reviews! 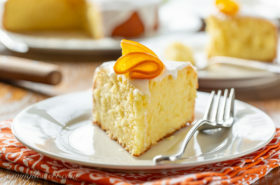 It seems that you can't go wrong with a Land O Lakes recipe! All I can say is wow, I really missed out on this. Your cookies will definitely be appreciated, they look like my favorite holiday cookies ever! Hi Tricia!! I never had thumbprint cookies and I'm so glad you introduced me to your version. They were excellent and arrived all beautifully intact. Thanks so much!! I love thumbprint cookies! This is the one recipe that I simply have not managed to get right in a gluten free version. I've probably tried it even more times than the almond bars! I am going to try once more before Christmas though. Fingers are crossed! <br /><br />Yours are absolutely gorgeous! I would have loved to receive those. YUM! Aww thanks [email protected] Hope you are doing great – so happy you're back in the blog world! We missed you. Let me know how the almond flour version turns out – I'm always looking for a gluten free recipe!